PETALING JAYA: Property developer Mah Sing Group Bhd is planning a mixed development project in Wujin, Jiangsu province in China, with an estimated investment cost of US$620mil. The company, via wholly-owned subsidiary Mah Sing International (HK) Ltd, yesterday signed a letter of intent with the Wujin Government to develop the said project. In a statement yesterday, Mah Sing said it would establish a joint-venture (JV) company with China-based developer DanLong Realty (Beijing) Co to jointly develop a 87.31-acre site along Wuyi Road, a major thoroughfare in the central area of the Wujin district. The Wujin Government had also given the JV company the opportunity to explore additional land, namely 53.13 acres north of Wujin High-New Zone of Zhangzhou City and 82.37 acres at the north intersection of Wunan Road and Wuyi Road, Wujin District, it said. In a separate statement, Mah Sing said it had acquired 3.38 acres of freehold land in Penang for a cash consideration of RM38.65mil via its wholly-owned subsidiary, Klassik Tropika Sdn Bhd. Mah Sing said the land in George Town would be developed into a high-end condominium with an estimated gross development value of RM280mil. “The acquisition is strategic as it allows the group to tap on the success and spillover demand of Mah Sing’s Residence@Southbay project in Batu Maung,” Mah Sing said. Mah Sing and Danlong Realty (Beijing) will form a 51:49 joint venture to develop an 87-acre site in Wujin into medium-to-high-end residential and commercial properties. Property developer Mah Sing Group Bhd said it will partner Chinese counterpart Danlong Realty (Beijing) Co Ltd to develop a US$620 million (RM2.1 billion) mixed property development project in Wujin, China. This will be its maiden property venture in China. The news, which it announced in a filing to the stock exchange yesterday, helped its shares surge 6.9 per cent to close at RM1.85 yesterday. It was its highest close in about six weeks. Mah Sing said its wholly-owned unit and Danlong will form a 51:49 joint venture that will invest US$80 million (RM270 million) in proportion to their stakeholdings as registered capital. Its unit, Mah Sing International (HK) Ltd, and Danlong yesterday signed a letter of intent with the Wujin government to first develop an 87-acre site along Wuyi Road in central Wujin into medium-to-high-end residential and commercial properties. The land faces the Beijing-Hangzhou Great Canal. Mah Sing said the Wujin government has also given the joint venture the opportunity to explore two additional plots of land. 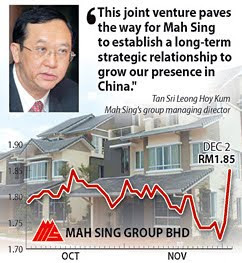 "This joint venture paves the way for Mah Sing to establish a long-term strategic relationship to grow our presence in China," Mah Sing's group managing director Tan Sri Leong Hoy Kum said. Property developer Mah Sing Group Bhd plans to develop an upscale condominium worth RM280 million at Pykett Avenue in George Town, Penang. The group is in the process of buying the 1.37ha prime freehold land from owner Khaw Bian Cheng Sdn Bhd for RM38.7 million, or RM262.19, per sq ft.
At present, there is a dilapidated unoccupied small bungalow on the site. In a filing to Bursa Malaysia yesterday, Mah Sing said that its wholly-owned unit, Klassik Tropika Development Sdn Bhd, had signed a sale and purchase agreement with Khaw Bian Cheng for the proposed acquisition. The transaction is expected to be completed in the financial year ending December 31 2010. Mah Sing said it will be procuring a development order in respect of the proposed development from the relevant authorities for approval. "Therefore, it is currently too preliminary to ascertain the total development cost and the expected profit to be derived from the proposed development," Mah Sing said. If approval is granted, construction could start in the second half of next year. Mah Sing said that no valuation was carried out on the land and was thus unable to disclose its net book value as it was not privy to this information. The group intends to fund the proposed acquisition and development cost of the land through internally generated funds and/or bank borrowings. Mah Sing added that the proposed acquisition is strategic as it allows the group to tap the success and spillover demand of its Residence@Southbay project in Batu Maung. "Residence@Southbay comprises superlink homes and the launched phases are 90 per cent sold. The encouraging take-up reflects Mah Sing's strong branding on Penang island and the group is confident of replicating that success with the new condominium project," it said. The Pykett Avenue parcel is located near major establishments such as the Chinese Recreation Club and Penang Plaza along Burma Road, and Komtar. There is ready infrastructure with good accessibility through some major roads, and it is close to amenities and facilities. According to the National Property Information Centre, the outlook for residential properties in Penang is promising as the residential stock overhang in the state is the lowest of the big three markets, namely Klang Valley, Johor and Penang. JOHOR BARU: The property market here, like in other parts of the country, is regaining momentum after experiencing a slowdown almost a year ago following the global economic recession. Wong was speaking to StarBiz at the launch of 58 double-storey Deanna III terrace houses at Taman Seri Austin near here by the Johor Baru City Council corporate and public relations director Abd Rahman Abdullah. The four-bedroom and three-bathroom houses with a built-up area of 196.39 sq m in a gated and guarded precinct are priced from RM286,800. He said July’s launch of 122 units of Deanna II double-storey terrace houses priced from RM300,048 was already 80% taken up. Wong said demand for houses priced from RM250,000 and below RM300,000 in Johor Baru was relatively good and the company, a unit of United Malayan Land Bhd, planned to launch more of such houses next year. He said the company would only launch high-end properties comprising bungalows and semi-detached houses in 2011 when the economy was expected to have fully recovered. “The Johor Baru property market is now becoming more consumer-driven and apart from design and quality finished products, buyers are also looking at location,” said Wong. He said Taman Seri Austin’s location in the Tebrau growth corridor, one of the current hotspots for property development in Johor Baru, augured well for the company. The housing scheme on 202.34ha site was launched in 2005 and is now 25% developed with 1,300 units of residential and commercial properties, of which 90% has been sold. Wong said upon completion within the next eight years, the project would have 5,700 properties and 30,000 residents and generate RM1.2bil in gross development value. A Legoland theme park will open in Malaysia’s south in 2012 at a cost of RM700 million, one year earlier than scheduled, developers said today. Iskandar Investment Bhd (IIB) president and chief executive officer Arlida Ariff said the theme park covering 26 hectares (62.4 acres) in Johor, which neighbours Singapore, is now slated to open in April 2012. “The selection of Legoland is very deliberate. The (planned) theme park in Singapore by Universal Studios is for young adults. Our is for families. It will be complementary rather than competition,” she said. The Malaysian attraction will be the first Legoland in Asia. IIB is an investment holding company linked to the RM17.7 billion Iskandar Development Region (IDR), a major infrastructure project in Johor. The IDR, launched in November 2006, will be 2.5 times the size of Singapore when completed, including up-market residential homes, a logistics hub, a waterfront city, a medical hub and an educational city. In 2008 IIB signed an agreement with Merlin Entertainments which operates various attractions globally including Sea Life, Madame Tussauds and Legoland. Merlin Entertainments will design and operate the theme park of which it will be a 20 per cent shareholder, with a consortium led by IIB owning the remainder. Arlida said the theme park will offer 40 interactive rides, shows and attractions targeted at families with children aged between two and 12 years. Legoland Development general manager John Ussher said the main concerns in developing the theme park in a tropical region were the “sun and rain.” Extensive use of shades and trees will be deployed to cool the park and make visitors more comfortable, he said. Malaysia has long harboured ambitions of turning Johor into a major metropolis to rival gleaming Singapore, which lies across a narrow waterway. The managers of 11 Malaysian real estate investment trusts (REITs) have teamed up to set up the Malaysian REIT Managers Association (M-REITMA), allowing players in the sector to work closer with the authorities to grow the industry. "For the purpose of registration with the Registrar of Societies (ROS), we have proceeded to form a protem committee comprising seed members from Am ARA REIT Managers Sdn Bhd and Axis REIT Managers Bhd when we handed in our application to register the association to the ROS on September 4," said protem committee chairman Steward Labrooy of Axis REIT in a statement. "Without an official association representing members of the local REIT industry, it soon became apparent to all of us that we were unable to have effective dialogues with the regulators and the Ministry of Finance in order to communicate the issues facing the industry and to propose changes," it added. The association, currently pending approval from ROS, will comprise AmFirst REIT, AmanahRaya REIT, Atrium REIT, Axis-REIT, Al-Hadharah Boustead REIT, Al-Aqar KPJ REIT, Hektar REIT, Quill Capita Trust, UOA REIT, Tower REIT and Starhill REIT. The REIT sector is now over four years old, with the first REIT having listed in August 2005. Today, there are 13 listed REITS with a market capitalisation of RM5.4 billion.